The Special of The Day...From the Orange Moon Cafe: “Farewell To a Friend"
Several weeks ago, Frances and I said farewell to an old friend. He served us well, and as we drove away never to see him again, we both felt grateful and a bit sad. We purchased our 2000 Toyota Corolla 16 years ago. It had 13,000 miles on it at the time, and by the time it became a fading image in our rear view mirror, our friend had carried us on journeys that totaled more than 180,000 miles. The car required few repairs over the years, and although we haven't felt comfortable to take it on road trips in quite awhile, it's been great for in town travel. Most importantly, we estimate it carried us to nearly 4,000 services in the last decade and a half, never once breaking down when we were going to and fro. I must admit that looking at the image above makes me sad yet again, but also grateful for a new friend, our 2016, yes, Toyota Corolla! If the current edition serves us as well as the old, we will be more than grateful. I've often shared with you that my philosophy of life is simply, "Show up!" If we arrive on time, ready, and prepared for our responsibilities, I have no doubt the Lord takes it from there. He even works in us to help us prepare. However, we do have a role, as led and enabled by the Holy Spirit. We determine to be where the Lord would have us to be, when He would have us to be there. He then empowers our faithfulness, and works mightily to fulfill His purposes in and through us. "By the grace of God I am what I am, and His grace which was bestowed upon me was not in vain; but I labored more abundantly than they all: yet not I, but the grace of God which was with me" (I Corinthians 15:10). As I took the last drive in the old Toyota, I decided to talk to it. "I'm quite sure that cars have no heart and mind, but if you did, this is what I'd say: You always showed up, old friend. You faithfully served us, and in so doing, you even more faithfully served the Lord and people. For that I will be eternally grateful, and I really do thank you." Of course, I then spoke to the One who does have a heart and mind. I gave even more thanks in the realization that the car He provided so long ago served as His gift to us, and to the people to whom we are blessed to minister. Indeed, our family was shocked when we finally traded cars because they know how I felt about the old Toyota. The new model has a lot to live up to, and I hope it does. 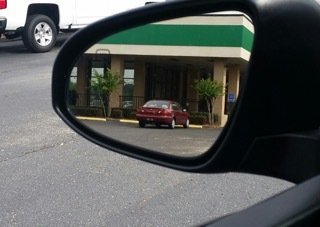 I'm sure it will because I have every bit as much confidence that the Lord will enable our current Corolla to show up just as faithfully as did that little red car we last glimpsed in the rear view mirror as we drove away.